Let us assume that , so that the spheroid is very close to being a sphere. If then the spheroid is slightly squashed along its symmetry axis and is termed oblate. Likewise, if then the spheroid is slightly elongated along its axis and is termed prolate. (See Figure 3.1.) Of course, if then the spheroid reduces to a sphere. 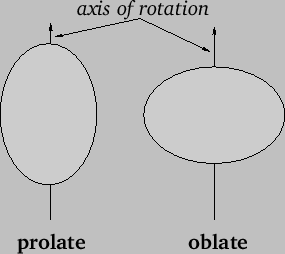 Figure 3.1: Prolate and oblate spheroids. Here, the integral is taken over the whole cross section of the distribution in - space. Consider a self-gravitating spheroid of mass , mean radius , and ellipticity , such as a star or a planet. Assuming, for the sake of simplicity, that the spheroid is composed of uniform-density incompressible fluid, it follows that the gravitational potential on its surface is given by Equation (3.69). However, the condition for an equilibrium state is that the potential be constant over the surface. If this is not the case then there will be gravitational forces acting tangential to the surface. Such forces cannot be balanced by internal fluid pressure, which only acts normal to the surface. Hence, from Equation (3.69), it is clear that the condition for equilibrium is . In other words, the equilibrium configuration of a uniform-density, self-gravitating, fluid, mass distribution is a sphere. Deviations from this configuration can only be caused by forces in addition to self-gravity and internal fluid pressure; for instance, internal tensile forces, centrifugal forces due to rotation, and tidal forces due to orbiting masses. (See Chapter 6.) The same is true for a self-gravitating mass distribution of non-uniform density. It follows that only a rocky body whose radius is significantly less than about --for instance, the two moons of Mars, Phobos (see Figure 3.2) and Deimos--can retain a highly non-spherical shape. On the other hand, a rocky body whose radius is significantly greater than about --for instance, the asteroid Ceres (see Figure 3.3) and the Earth's moon--is forced by gravity to be essentially spherical. 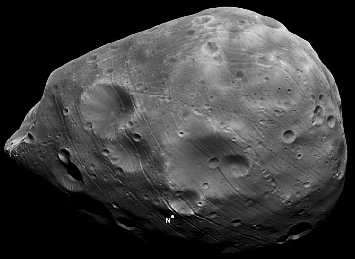 Figure: The martian moon Phobos (mean radius ). Photograph taken by the European Space Agency's Mars Express spacecraft in 2010. Credit: G. Neukum (ESA/DLR/FU Berlin). However, this is just the gravitational potential of a point particle, located at the center of the body, whose mass is equal to that of the body. This suggests that the gravitational interaction between two irregularly shaped bodies in the solar system can be approximated as the interaction of two point masses, provided that the distance between the bodies is much larger than the sum of their radii. 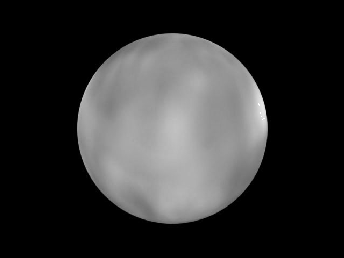 Figure: The asteroid Ceres (mean radius ). Photograph taken by the Hubble Space Telescope. Credit: NASA, ESA, J.-Y. Li (University of Maryland) and G. Bacon (STScI).